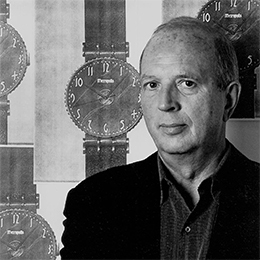 IDSA Fellow William Plumb has passed away at the age of 84 in Piermont, NY. He is survived by his wife of 43 years Catherine​ Plumb, and children Christian Plumb and Abigail Plumb-Larrick. His daughter also works in design and human factors—in software—at Rockwell Automation. "My father believed in the marriage of beauty and usability at the heart of industrial design," his daughter tells the Society. "IDSA provided him with the fellowship of like minds, and he was proud to serve in various roles within the organization." Plumb served as president of plumb inc., a design and marketing firm in Piermont, NY, and as president of Avecmedia, Inc. of Norwalk, CT, a developer and licensor of patented concepts for media packaging. He was inducted into IDSA's Academy of Fellows in 1983. Plumb was named a Fellow of the American Academy in Rome (FAAR). In 1986, he earned a Prix de Rome from FAAR. He also served several terms as a vice president of the academy. Plumb earned a degree in industrial design from Cornell University and pursued graduate studies at the Politecnico di Milano in Italy. He began his design career in the studio of Gio Ponti, the noted Milanese architect/designer, and, while living in Milan, also worked as a consultant to the Ufficio Sviluppo (development office) of La Rinascente department stores. In the United States, Plumb joined the firm of Eliot Noyes and Associates. Noyes, who also became an IDSA Fellow, was the founder and then-consultant director of the IBM Corporate Design Program, where Plumb was involved in a wide variety of activities from brand identity to the design and development of successful IBM products. Plumb opened a design firm in New York City in 1963 with IBM as his first client, followed by other major corporations such as Apple, AT&T, Bussman (Buss-brand fuses), Corning, Dictaphone, Du Pont (Corian-brand solid surface material), Hitachi, IBM, International Paper, Ricoh, Savin and United Technologies. Projects for which Plumb was responsible were published widely and included in exhibitions at leading museums such as Museum of Modern Art in New York City, Brooklyn Museum, Philadelphia Museum of Art and Whitney Museum. Plumb-designed products won "Gute Form" design awards at the Hanover Fair in Germany. Plumb wrote extensively on design and marketing for many publications. He was a long-time member of the Editorial Advisory Board of ID magazine. Articles about him and his firm appeared in ID, Metropolis, Interiors, Fortune, Domus and other publications. Plumb lectured at Cornell Univeristy, Pratt Institute, Ohio State University, Rochester Institute of Technology, University of the Arts, Rhode Island School of Design (RISD), Art Center College in Pasedena and American Academy in Rome. He taught studio design courses at University of the Arts and RISD. Plumb was qualified and testified as an expert witness in a number of intellectual property cases for New York City and Norwalk, CT law firms. To post your rememberances of Plumb below this article in the "Add New Comment" section, please login first to IDSA.org.